Today I completed my 32nd Compassion sponsor child visit when I visited 8-year-old Aljane and her family in the Philippines. 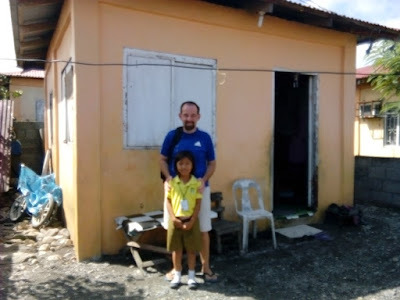 It was a little bit different to all the other visits I’ve done, because I lived in her community for ten months in 2014 when I served at Ruel Foundation orphanage, and attended the church which runs her Compassion Project, PH268. Because of this church connection, I formed friendships with the incredible people who work at the Project. When I returned to Australia I sponsored Aljane so I would have an on-going link to the church, and have an excuse to come back and visit! In August 2015 I made the decision to return to Ruel Foundation for a three week stint in late December/January, so of course I had to organise to meet Aljane. She is 8 years old, in second grade and dreams of being a teacher. Because of Compassion, she has the opportunity to achieve that dream. In 2015 Aljane wrote me the most letters out of all my 22 sponsored kids (6). I made sure to tell her that today, and hope it made her feel good and encouraged her to keep writing. As important as it is to write to our sponsored kids, sponsors like receiving letters as well. I caught a motorized tricycle from Ruel and arrived at the church at 9.30am. Project activities were in full swing. I met my host AM and we quickly went around to all the classes. It was fun because many of the kids remembered me from when I briefly helped out at the Project in 2014. The oldest kids at PH268 are now 14 years old, and they were suitably awkward and shy. Aljane’s class was the last we visited, then I met the rest of the family and we headed to their house nearby. Aljane is the fourth of five children; she has one sister (14) and three brothers (13, 11 and 8 months). The names of her and her three brothers all start with “Alj-“, an amalgamation of her father and mother’s names. I was very happy to meet the whole family today, because in the past it hasn’t always happened. As much as my ego would like to imagine it, the lives of people in the developing world do not stop just because their child’s sponsor visits. I am thankful for each visit I am able to meet the whole family. Aljane’s father works two jobs to provide for his family. He is a hairdresser for both men and women and is also the Barangay (neighbourhood) security guard, and roams around making sure everything is okay. As part of this job he is able to drive a motorized tricycle, which helps the family get around. Her mother was smiley and friendly, and also spoke some English which helped our interaction. I asked the four children who could talk (obviously the eight-month-old was excluded from this conversation) what their dreams were and got four very different responses: chef (Miss 14), doctor (Mr 11), policeman (Mr 13) and teacher (Aljane). Later on I asked Mama about the nature of her children’s relationship and she said they fight sometimes and love each other sometimes, much like any sibling group I guess. They each have allocated jobs around the house, whether it is cooking, washing the dishes, feeding the pets or sweeping the floor. I learned that the family had been living in their current neighbourhood for three years. They had previously been squatters but were then given the materials for a house by the government, which they had to build from scratch with the help of friends. The five children all sleep in one room. There is also a living room, a CR (toilet/bathroom), small kitchen and the parents bedroom. Although the neighbourhood is not well-developed from a building point of view, the family said they feel safe and it is better than their last neighbourhood, where they were living close to the river and would often get flooded. The conversation was largely driven by me, so pretty soon it petered out. I whipped out a photo book I had made, containing 18 A4-sized collages of family and childhood pictures. I went through them and then revealed a set of Uno cards I had brought as a gift. None of them had played Uno before, so I explained the game with the help of my translator AM and we played a few rounds. Everyone including Mama got involved, while my friend Kuya Ace sat outside talking to Aljane’s father. One thing I love about Compassion staff is that they truly invest in and get to know the families. This enables them to serve the families effectively and make sure the sponsors money is put to good use by providing for their needs. After a few rounds of Uno it was time to go to lunch. When asked where we should go, Aljane had no hesitation in saying “Jollibee!” so we piled into the van driven by a local church member and headed for Robinson’s Mall. Once again I opted to take the whole family rather than just Aljane and one parent which is standard Compassion policy. I have come to believe that providing an opportunity for families to eat out together, regardless of how many members, is worth any expense and over my many visits we have had some pretty large and excited groups. We forgot to pack the Uno cards, so the time spent waiting for the food was quite silent and awkward. Pretty soon it arrived and we all tucked in. We were treated to a visit from the Jollibee mascot (funnily enough, a giant bee) and there was much excitement in the air. Aljane’s eyes were dancing and her mouth was wide open. We managed to get a couple of pics with the ‘Bee, which I’d say will definitely be a life highlight in the Calooy household. After lunch we headed to the mall for a stroll. We found a children’s playhouse out the back of the mall and I paid for Aljane and the two older brothers to have a play. It had a small trampoline, ball pit, slide, swing, tunnel etc. It was actually meant for children aged 2-6 but this did nothing to dampen the incredible excitement all three children displayed and they ran themselves ragged while I talked to Mama, AM and Kuya Ace. Everyone who is a parent or who cares for children in other roles would agree that, in general, we do anything to give our children moments of joy. This is what I experienced on this afternoon. It was so good to hear the squeals of excitement, the running, jumping and exuberance of these kids. Giving them the opportunity to be kids and just have fun. Worth every dollar. Aljane is the only one of her siblings to be registered and sponsored with Compassion, as the others are too old. I am her first and only sponsor. Mama was honest when I asked if this had created any jealousy with her siblings, and she said yes. There may be an opportunity for her baby brother to be sponsored when he is a bit older. I asked Mama how Compassion had helped her family and she said mainly with school fees, school supplies and medical check-ups. It’s great to know that my money is being genuinely used to help with the material needs of this family and specifically Aljane so she can achieve her full potential. I was able to have a great conversation with Project workers AM and Ace, and I explained my motivation for sponsoring and visiting so many kids. I also talked about my perspective on the importance of letter writing (received the kick up the bum on my first visit in 2009 after only writing one or two letters a year and now write once a month) and talked about my experience with encouraging and praying for the Project workers any opportunity I got, since they often feel forgotten and discouraged while engaging in the messy work of investing in and loving families in the grip of poverty. It is incredibly difficult work and they need to know that the work they do is valued, appreciated and important. I got a big laugh when I asked Miss 14 about what she liked to cook. When we were at the family's house I noticed a large stack of about 15 cans of sardines. They had stocked up just before the recent typhoon and while the typhoon has gone, the sardines remain. So after asking what she liked to cook, I immediately added "Sardines?" which produced much laughter and a definite answer of "No!" After having a play, we left the mall and headed back to the Project. I had a kick of my Australian football with a few of the kids, prayed with the family in the middle of the church’s basketball court which I helped to fund back in 2014 and said goodbye. Overall it was a positive and special day and I was thankful to Aljane’s family for inviting me into their home and treating me with friendliness and generosity. I feel blessed to be able to use what God has given me to contribute something positive to this family and I look forward to seeing what happens in their future. Thanks for sharing about this visit! I always love the glimpse into the lives of sponsored kids and the inside look of a project that you provide through these posts!